Johannes was born in 1438 in Braunschweig, Kingdom of Brunswick, Saxony. He died in 1503. His occupation was Court Astrologer to Emperor Frederick III. Frederick III of Habsburg (Innsbruck, September 21, 1415 – August 19, 1493 in Linz) was elected as German King as the successor of Albert II in 1440. He was the son of Duke Ernest the Iron from the Leopoldinian line of the Habsburg family ruling Inner Austria, i.e. Styria, Carinthia and Carniola, and of his wife Cymburgis of Masovia. As an Austrian Habsburg Duke, he became Frederick V in 1424, and Frederick IV as Geman king, and then Frederick III with his coronation as Holy Roman Emperor. He married in 1452, at age 37, the 18-year-old Princess Eleonor of Portugal, whose dowry helped him to alleviate his debts and cement his power. Frederick was the last Emperor to be crowned in Rome, being crowned in 1452 by Pope Nicholas V. He opposed the reform of the Holy Roman Empire at that time and was barely able to prevent the electors from electing another king. Philip Lichtenberger was born in1477 in Kusel, Grand Duchy of Oldenburg, Nordpfalzer-berg, Germany. Philip was born in 1477 in Kusel, Grand Duchy of Oldenburg, Nordpfalzer-berg, Germany. His occupation was Amtsmann in Kreuznach. With the division of the Saxon country the administrative structures became unclear in Leipzig in 1485. With the development of the Saxon state uniformed administrative structures began gradually to develop. In the Middle Ages the Saxon area was divided into governor’s residence, apart from the central administration. Out of this new jobs developed in the 15th century. The “administrators” (Amtsmann) practised the jurisdiction, and were responsible for the military quantity and public security. The administrators came from the rural aristocracy. Leonard Lichtenberger was born in 1546 in Kusel, Grand Duchy of Oldenburg in Nordpfalzer-begland. He died on 21 August 1613 in Nordpfalzer-bergland, Germany. Leonard was born in 1546 in Kusel, Grand Duchy of Oldenburg in Nordpfalzer-begland. His occupation was as Amtsverweser or deputy regent. He married Anna Katharina Donner about 1567 in Kusel, Grand Duchy of Oldenburg, Nordpfalzer-bergland, Germany. He died on 21 August 1613 in Nordpfalzer-bergland, Germany. Vitus "Veit" Lichtenberger was born in 1581 in Nordpfalzer-bergland, Germany. He died on 11 November 1635 in Birkenfeld, Nordpfalzer-bergland, Germany. Vitus was born in 1581 in Nordpfalzer-bergland, Germany. . He married Barbara Frankengruner in 1612 in Herrstein bei Fischbach a.d., Nahe, Rheinland-Pfalz, Germany. He died on 11 November 1635 in Birkenfeld, Nordpfalzer-bergland, Germany. Johann Conrad Lichtenberger was born on 25 September 1651 in Lauterrecken a.d. Glan, Nordpfalzer-bergland, Deutschland. Anna Elizabeth Caspari on 13 November 1696 in Winterburg a.d. Ellerbach bei Bad Kreuznach, Germany. He died on 17 June 1702 in Flonheim bei Alzey, Alzeyer-Hugelland, Germany. Johann Georg Lichtenberger was born in 1697 in Lauterrecken a.d. Glan, Nordpfalzer-bergland, Deutschland. Johann was born in 1697 in Lauterrecken a.d. Glan, Nordpfalzer-bergland, Deutschland. He immigrated to the United States on 13 October 1766 on the ship Betsey from Germany. The Foreigners whose names are underwritten, imported in the Ship Betsy, John Osmond, Master, from Rotterdam, but last from Cowes, did this day take and subscribe the usual Qualifications. In the List 95. Whole Freights 154. (Consigned to Saml Howell) pd January 1767. [List 260 C] At the dwelling House of John Lawrence, Esqr, Mayor, Philada October, the 15th 1766. Present the sd John Lawrence, Esqr, Mayor. Johann Casper LichtenbergerJohann was born on 6 March 1726 in Rhine Palatine, Germany. He married Anna Maria Clara Eisenmanger (daughter of John Eisenmanger and Elizabeth Lieb). He immigrated to the United States on 15 Seotember 1752 on the ship "Two Brothers" Thomas Arnot, Master, from Rotterdam. The Ship Two Brothers 1752List 177 CAt the Court House at Philadelphia. The Foreigners whose Names are hereunder written, imported in the Ship Two Brothers, Commanded by Thomas Arnot, from Rotterdam but last from Cowes in England, took the Qualifications to the Government in the usual Form. The Fate of the Ship "Two Brothers"
Below is a notice from the Pennsylvania Journal September 25, 1754. It was a copy of an article from the London Newspaper, August 5, 1754. A few days hence captain Arnot bound from Rotterdam to Philadelphia upward of 300 palatine passengers on board in passage struck a sandbar beat off her rutter. Somewhere between 220 and 300 Palentines passengers drowned when the ship went down in sight of the Dutch ship which just left them to drown. Insensible to their distress thought proper to continue his course and left. Deserting upwards of 80 souls out of the above number. Captain Henderson bound for the coast of New Guinea took them on board and landed them on Thursday seven PM at on the coast near Rotterdam, then proceeded on his voyage. So apparently it hit a sandbar, sank and only a small number of those passengers were saved, and apparently the crew was saved. So that is what happened to the ship the two brothers. These voyages were definitely risky. They had the following children:Adam Lichtenberger born Est. 1745-1772, York, PA.John Killan Lichtenberger born 3 February 1753, York, PA; died 13 May 1835, Somerset Co, PAJohn George Lichtenberger born 1 April 1754.Anna Maria Lichtenberger born 8 March 1756; died 16 September 1843, Somerset Co., PA.Marie Christin Lichtenberger born 27 January 1760, York, PA; died 20 October 1820, York, PA. John Casper LichtenbergerJohn Casper LichtenbergerJohn "Casper" was born on 25 August 1761 in York County, Pennsylvania. He was christened on 4 October 1761 at the Christ Lutheran Church, York, York County, Pennsylvania. Christened: Sponsors-Conrad Klein & Susana. He married Anna Margaretha. Anna was born in 1761. He died on 1 April 1834.COUNTY OF YORK-1779 Tax Records. Acres. Negroes. Horses. Cattle. Tax.Lichtenberger, Killian 74 1 3 8 1 6Lichtenberger, Casper 20 2 6 9 0Lichtenberger, George 1 6 9 0They had the following children:George Lichtenberger was born on 25 September 1794. He died on 14 July 1854 He is buried at Manchaster Zions Church Cemetery in Pennsylvania.Henry "Heinrich" Lichtenberger was born in 1812 in York County, PennsylvaniaHe died in 1 June 1840. James B. LichtenbergerJames was born in 11 May 1833 in Pennsylvania. He married Ann Mary Bentz Between 1850 and 1858 he married Ann in Pennsylvania. They moved from Pennsylvania to Illinois between 1858 and 1860. James was very active in local government. The 1880 Federal Census shows James and his family living in Whitmore, Macon County, Illinois as a Farmer. James Lichtenberger, whose death at his home in Decatur was announced in last week’s paper, was buried Sunday, the services being conducted at Union Church near Oreana and the interment being in the adjoining cemetery. The cortege left the house at nine o’clock. Mr. Lichtenberger was born at Manchester, Penn., May 11, 1833. He came to Illinois at an early day and lived for many years I Whitmore township, serving from that town for several terms on the board of supervisors. He was married twice, his second wife being Mrs. Susan Franklin, to whom he was married about ten years ago, and he moved to Maroa at that time. By his first wife two sons survive him, Henry of Long Creek township, and one son living in Colorado. As a resident of Maroa Mr. Lichtenberger was a prominent republican worker and politician in local affairs. He accumulated considerable property during his life and at one time owned a large farm near Oreana, selling it a few years ago and investing the proceeds largely in Decatur city property. He and his wife, who still survives him, moved to Decatur about three years ago and have since resided there. Until a few months ago he frequently came to Maroa, but since the ravages of disease began their insidious advances he was confined mostly to his home. He died at 8:30 P.M. January 31, the cause of his death being a complication of diseases and old age, rheumatism and dropsy forming two of his principal ailments. Robert Machan is named as executor and he is given full power to sign deeds and make all necessary transfers to convert the estate into cash within a year after the death of the testator. The property so converted is to be equally divided among his children or their children. The heirs of his deceased son, Allen Lichtenberger get one-seventh; Jessie Reavis, son of Mary Reavis, receive one-seventh; Mabel and Roy Froman, children of Lizzie Froman, receive between them one-seventh; Harry and Virgil, sons of James Lichtenberger Jr. receive one-seventh; Grace L. daughter of Charles Lichtenberger, receives one-seventh; and a son, Jesse Lichtenberger, receives one-seventh. Jesse (J.B.) was born in November 1876 in Illinois. 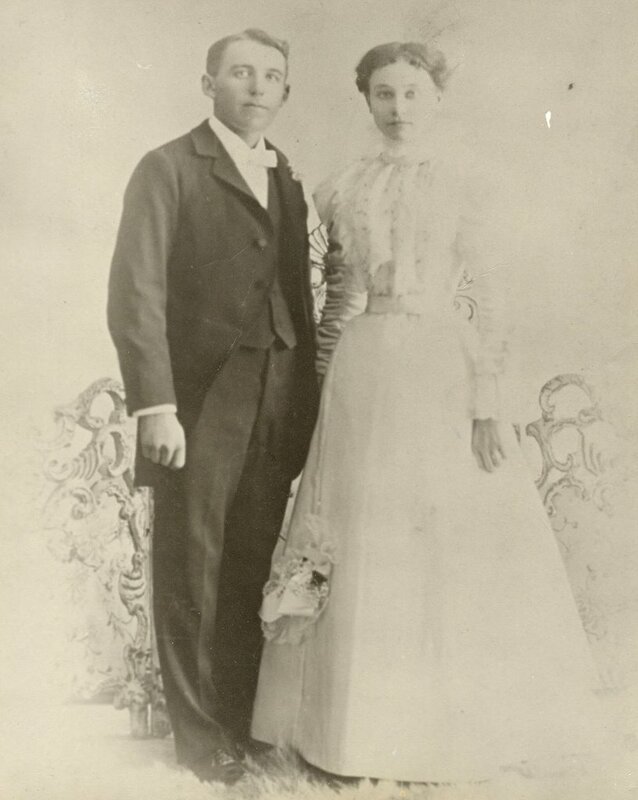 He married Anna (Rosana) Coleman on 22 September 1897 in Decatur, Illinois. The 1900 Federal Census shows Jessie and his family living in Sangamon, Piatt County, Illinois working as a rail road laborer. J.B. was very active in the Independent Order of Odd Fellows and records show J. B initiated in the first half of 1907 in Maramec Lodge #181; he served as Secretary of the lodge from 1908 until middle of 1909 and then served as Noble Grand (head of Lodge) in 1909. The lodge is still functioning but very small. He died on 21 April 1911 in Maramec, Pawnee County, Oklahoma. He is buried at the Independent Order of Odd Fellows Cemetery, Maramec, Pawnee County, Oklahoma next to his son Carl, who died at 3 months old. Lodge Eulogy for J. B. Lichtenberger "It has pleased the Supreme Ruler of the Universe to remove by death, one our number, J.B. Lichtenberger. We knew him as a business man, as a father, as a husband, as a citizen, and as a brother. He was a superior man in business, thoughtful, careful and considerate. As a father, he was kind, and took a great interest in his children. He often had them with him when at work. As a husband, he was true, loyal, and affectionate, ever striving to please and comfort his dear wife. As a citizen and brother, he was loved most by those who knew him best. To know him, was to love and respect him. To know him well, as we did, was to bound to him in brotherly love. In our daily affairs, in our lodge, in the home will be missed one of the best fathers, husbands, and brothers in our community. Therefore be it resolved by the members of the Maramec I.O.O.F. lodge, severally and as a body, that we bow our heads in submission to that One that does all things well, and extend our heart-felt sympathy to the bereaved wife and little children and that we here-by pledge to them our aid, counsel, and protection in the future. Resolved further that we drape our charter for thirty days, that these resolutions be spread on the minutes and a copy be given to the bereaved family." Mr. J.B. LICHTENBERGER, Santa Fe depot agent at Maramec, died last Friday. He had suffered from consumption for some time, and last year the company transferred him to a station in Colorado, in the hope that the change would benefit his health. Mr. Lichtenberger felt so improved after a residence in Colorado, that he thought it was all right for him to return to Maramec, where he had property interests. He was a man very highly respected by all who knew him. They had the following children:Herald C. Lichtenberger was born 1901 in Illinois. Ralph C. Lichtenberger was born on 30 Sep 1902 in Colorado. He died on 12 Dec 1956 in Los Angeles, California. He is buried in Green Hills Memorial Park, Rancho Palos Verdes, Ca. Blanche H. Lichtenberger was born 21 Aug 1905 in Oklahoma. She died on 12 May 1989 in Lakewood, Jefferson, Colorado. Mable Irene Lichtenberger was born on 27 September 1898 in Illinois. She died on 17 February 1996 in Orange, California. Mable Irene LichtenbergerMable Irene was born on 27 September 1898 in Illinois. She married William Sidney Smith in Oklahoma. Mable was a homemaker and mother. She was a spiritual woman, and devout christian. She died on 17 February 1996 in Orange, California. Shee is buried at Fairhaven Memorial Cemetery in Orange, California. Mable Irene Smith, 97, a Santa Ana homemaker, died Saturday of natural causes. Services: 2:30 p.m. Thursday, Fairhaven Memorial Park, Santa Ana.Survivors: daughters, Hazel Kidd, Arlene Whitney; son, Ronald; 12 grandchildren; 21 great-grandchildren; 25 great-great-grandchildren. Arlene L. Smith was born 13 Sep 1920 in Stillwater, Oklahoma, and died 23 Mar 1999 in Irvine, California. Ronald C. Smith was born on 14 August 1938 in Laguna Beach, California. Hazel Smith was born 1925 in Stillwater, Oklahoma. William Smith was born 18 Jun 1930 in Stillwater, Oklahoma, and died 24 Jul 1932 in Littleton, Colorado. William drowned in the water fountain outside the public library in Littleton. I'm interested to find out where most of the Lichtenbergers are living now in the US, I am a desendant of the Lichtenbergers on your tree.